(Seattle, Wash.; June 22, 2010) – Jensen Maritime Consultants Inc. has been selected by Bollinger Shipyards, Inc., to complete the final design drawings and specifications for two new 10,880-horsepower, high-bollard-pull, ocean-going tugboats. The tugs are the beginning of a new-build program at Crowley Maritime Corporation to further enhance its ocean towing, salvage and offshore support capabilities. The Ocean Wave and Ocean Wind will have a minimum bollard pull of 150 metric tons and a range of approximately 12,600 nautical miles at 15 knots free running. The tugs will measure 144 feet long, 46 feet wide and have a draft of 20 feet. They will have twin screw, controllable pitch propellers (CPP), in nozzles, and will be equipped with high lift rudders. Once delivered, the long-range, high capacity, ocean-towing vessels will help further Crowley’s position as an industry leader in offshore towing for years to come. Jensen’s design efforts, led by Project Manager Eric Blumhagen, include vessel arrangements, hull and deckhouse lines, structural design, equipment foundations design and stability. Bollinger will be handling systems design and the production lofting effort. “We [Jensen] work with the shipyard and owner to ensure that the owner gets the boat that they want and the builder gets it done in a cost-effective way,” said Blumhagen. Bollinger, who won the new-build contract in February, is scheduled to deliver the first of the Ocean class tugs in 2011. 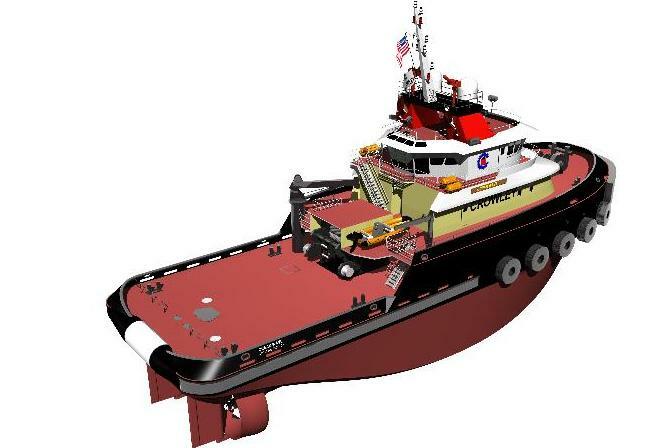 The tugs will be constructed at Bollinger Marine Fabricators in Amelia, La. “Bollinger is really excited to have the opportunity to build these tugs for Crowley, and we look forward to working with Jensen to facilitate in the design,” said Chris Bollinger, executive vice president of new construction. Jensen, a Crowley subsidiary, is a naval architecture and marine engineering firm located in Seattle that offers a diverse range of services developed from experience around the world. Jensen, formerly B.F. Jensen & Associates, has been a recognized leader in the design of all types of vessels for over 40 years, including workboats and passenger and fishing vessels. The company’s excellent reputation is built on a long history of successful designs and conversions with close attention to engineering basics. Jensen’s international on-site consulting services can provide customers with assistance anywhere in the world. Bollinger Shipyards, Inc., (www.bollingershipyards.com) owns and operates 12 shipyards strategically located between New Orleans and Houston with direct access to the Gulf of Mexico, Mississippi River and Intracoastal Waterway. Bollinger is a leading provider of new construction and other services to offshore energy, commercial and government marine markets and is the largest vessel repair/conversion company in the Gulf of Mexico region with a total of 32 dry-docks in Louisiana and Texas.